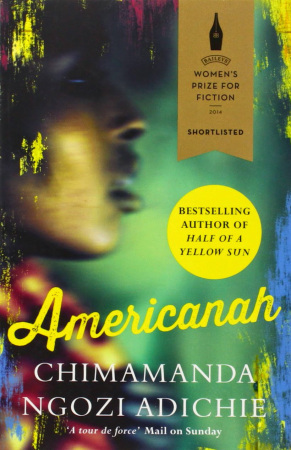 Americanah by Chimamanda Ngozi Adichie is a novel of social comedy and observation bound up in serious issues of identity, race, and culture, in a globalised world. Obinze and Ifemelu meet at high school in Nigeria and fall in love. When the unstable political regime causes disruption to their university lives, they separate to travel overseas and complete their studies. Ifemelu travels to America where she eventually comes to write an extremely popular lifestyle blog, while Obinze ends up in England, later returning to Nigeria to begin a successful career in real estate. The novel opens after a period of some years has passed, with Ifemelu deciding to return to Nigeria. She has a serious boyfriend, and Obinze a family, but they remain drawn to each other in spite of the distance between them and the time that has passed since their last meeting. The greatest success of this novel is the character of Ifemelu. Instantly likeable and engaging, Ifemelu is a well-rounded character with a distinct voice. The blog is an excellent device for providing Ifemelu with an outlet for dissecting the strange racial politics she encounters in America from the position of observer and commentator. This is not to say that Ifemelu is aloof from the narrative in any sense. Her personal struggles and the way she conducts herself in challenging situations are fully sympathetic and human. Ifemelu is a complex character who experiences anger, depression, love, confusion and empathy with others across her storyline. One of the most quietly striking aspects of the novel for me was a small episode in which Ifemelu experiences a period of depression. She doesn’t leave her room, eats at night so as not to bump into her housemates, discards communications from Obinze, and finds her movements heavy and sluggish. In spite of being told by a friend that she is depressed and should see a doctor, Ifemelu struggles to accept being medicalised in this way. Depression is an “American illness” a label that as a Nigerian she cannot accept. Episodes like this throughout the novel provide little windows through which Ifemelu’s experience can be felt. Another strength of Americanah is in its astute observations of the cultures in which Obinze and Ifemelu find themselves. Writing from a British perspective, I can better attest to the veracity of Obinze’s narrative in England than Ifemelu’s in America, and as far as that goes the incidents portrayed are absolutely like a mirror held to English society in the 1990s. Adichie captures the fears surrounding immigration that were–and, unfortunately, are still–a significant part of the political and journalistic landscape of this country, which often play out in racist attitudes both overt and insidious. She also presents us with an ugly portrait of the male working-classes guffawing over The Sun’s page 3 girls and bragging about sexual exploits. This picture is softened by the admission by one worker that he had been lying about his conquests. This character, Nigel, is also the only one to split his tip fairly with Obinze when they work together. In spite of the time spent in America particularly and England also, Nigeria is very much at the heart of this novel. It is a Nigeria of the middle and upper classes; professors and business people who fan themselves dramatically at the prospect of their children being educated in a Nigerian school instead of the English or French-speaking schools. It is a Nigeria where to have a white man as a company director is to make yourself a success, and where class is a factor of great importance. This world comes under the same slightly mocking gaze that fuels the rest of the book, exposing the foibles of the various characters as well as the darker elements of human nature and society. Ifemelu’s description of coming to America and finding herself no longer Nigerian, but simply ‘black’ (a state of affairs that was echoed to a lesser degree in Obinze’s experience) was particularly interesting. In coming to America, Ifemelu had to take on this new identity that put her together with Ghanaians, Jamaicans, and a host of other nationalities that she previously felt little connection with. She also has to take on the history of African Americans, and feel insulted by references to watermelons and tar babies that she doesn’t understand, all because this is what society expects. The racial politics within this overarching label of ‘black’ is something Adichie negotiates with great sensitivity. The sense of a ‘black community’ plays out over and above more individualised communities and identities, though Ifemelu is acutely aware of the differences within it, particularly relating to how she sees herself as a Nigerian. There is a tension between ‘black’ as a catch-all term that wipes out individual differences, overriding a variety of cultures and experiences, and ‘black’ as a minority community and political force that is necessary to support life in America. In her blog, Ifemelu purposely avoids stating her nationality. To her readers, she is a “Non- American Black.” This allows her to become a voice for a range of people, documenting their experience as a community. The ‘non-American black’ community is an entity in much in the same sense as the larger ‘black community,’ coming together as a minority over and above cultural differences in order to negotiate the world in which they find themselves. Americanah is written non-chronologically, taking you through a series of flashbacks from the moment Ifemelu decides to return to Nigeria. It is written in the third-person limited, split between Ifemelu and Obinze with Ifemelu very much stealing the spotlight; where Ifemelu’s narrative is infused with her wit and energy, Obinze’s sections are slightly drier. The book is written in a conversational style with exceptional dialogue that captures the distinct speech patterns and phraseology of Nigerian English, British English, and American English. Americanah is a very enjoyable book to read. The momentum of the main storyline is sustained through flashbacks and the back and forth of the narrative, which keep the reading experience fresh, and the characters and plot are compelling. The only critical observation I would make is that the romance between Obinze and Ifemelu is somewhat overshadowed by the rich tapestry of cross-cultural experiences and questions of nationality that permeate the layers of the novel.